For other uses of Kanyakumari, see Kanyakumari (disambiguation). Devi Kanya Kumari is goddess Parvati in the form of an adolescent girl child. Devi is also known as Shree Baala Bhadra or Shree Baala. She is popularly known as "sakthi" (Durga or Parvati) "Devi". The Bhagavathy Temple is located in Cape Kanya Kumari in Tamil Nadu, at the southern tip of main land India, there by located on the confluence of the Bay of Bengal, the Arabian Sea, and the Indian Ocean. She is also known by several other names, including Kanya Devi and Devi Kumari. She is also worshiped as Shree Bhadrakali by devotees. Sage Parashurama is said to have performed the consecration of the temple. The goddess is believed to be the one who removes the rigidity of our mind; devotees usually feel the tears in their eyes or even inside their mind when they pray to the goddess in devotion and contemplation. Kanyakumari Temple is one of the 51 Shakti Peetam. It is believed that the spine area of Sati’s corpse fell here creating the presence of kundalini sakthi in the region. As directed by his Guru Sri Ramakrishna Paramahamsa, Swami Vivekananda, came here to seek Devi's blessing in December 1892. It is in this location he decided to embark on the missionary work to a higher level of action rather than being passive like the usual Sanyasis. Swami Brahmananda (1863–1922) and Swami Nirmalananda (1863–1938), another two disciples of Sri Ramakrishna Parama Hamsa, also worshiped Devi Kanyakumari. In fact, Swami Nirmalananda brought several small girls from many parts of Kerala to worship goddess here in 1935-36 period. Seven girls later on became the members of the first batch of Nuns of the "Sarada Ashrama", a Hindu nunnery started later in 1948 in Ottapalam, Palakkad, Kerala by Swami Vishadananda. Kanyakumari is situated on the southern most tip of Indian ocean of Tamilnadu. The worship of Devi Kanya Kumari here dates back to the prehistoric period of kumari kandam. Kanya Kumari is a virgin goddess. Since Lord siva didn't keep his promise to marry her on one particular day, she was very upset and angry, and her anger was diverted to kill the demons. She remained a virgin and did penance. Devi Kanya Kumari has been mentioned in Ramayana, Mahabharata, and the Sangam works Manimekalai, Puranaanooru and Nārāyaṇa (Mahānārāyaṇa) Upanishad, a Vaishnava upanishad in the Taittiriya Samhita of Krishna Yajur Veda. The feminine aspects of The Almighty (in its manifested and un-manifested forms) are called as Prakriti, and the male aspects are called as Purusha. The Prakriti is addressed in different names by different Hindu communities as Adi-parashakti, Bhadra, Shakti, Devi, Bhagavathi, Amman, Rajarajeshwari, Shodashi; in different locations. All the material manifested aspects the Nature is classified as feminine and is the Prakriti or Mother Goddess and also the un-manifested forms Knowledge, Prosperity and Power are considered as feminine Prakriti, and it is source of energy for Creation, Sustain and Control, which is the male aspect (Purusha) of Prabrahma. In Tantra, the worship of Prakriti is done in different methods: Dakshinachara (Right-Hand Path) (Saatvika rites), Vamachara (Left-Hand Path)(Rajas rites) and Madhyama (Mixed) (Taamasa rites) in different temples. The name of Devi in temples during Saatvika or Dakshina rites is 'Shree Bhagavathy' and Vaama (left method) rites is called 'Maha Devi' similar to Maha Vidya. The mythological story dates back to the prehistoric Tamil period. Bana an asura by birth was the ruler of his land. He was a very powerful king. He practiced tapasya and obtained a boon from Lord Brahma that his death will only be by an adolescent virgin girl. With this powerful boon, he became fearless and wreaked havoc on the entire world. He went on to conquer and oust Lord Indra from his throne. He banished all the devas’ from there. The devas’ who were the personification of the basic natural elements, Agni (fire), Varuna (water), Vayu (air) went uncoordinated and havoc spread in the universe, because Indra (ether) was not able to administer and coordinate the Pancha bootha. Devi waited for the Lord and finally, she thought that she had been snubbed. With unbearable insult, pain, grief, and anger she destroyed everything she saw. She threw away all the food and broke her bangles. When she finally gained her composure she chooses to be a virgin forever and took to penance. Ages later Bana, tried to lure and approach the goddess without realizing who she was. The infuriated Bhagavathy, who was the Bhadrakali herself, slaughtered Bana at once. Moments before his death Bana realized that the one before him was Sakti, the Almighty itself. He prayed her to absolve him of his sins. Bhagavathy maintained her divine presence in the place, in the Devi Kanyakumari Temple. The presiding image is sported in standing posture with an Akshamala in her hands. There is an image of a lion in her pedestal indicating that she is the form of Durga. There is a four-pillar hall in the temple, each of which gives out sounds of Veena (a string instrument), Mrudanga (a percussion instrument), flute and Jalatharanga (porcelain instrument). Kanyakumari Temple is one of the 51 Shakti_Peetha. It is believed that the back spine area of Sati’s corpse fell here creating the presence of Kundalini Sakti in the region. The shrine is accessed through the Western door. The eastern door is opened only on certain days of a year, as on the new moon days in the months of Thai, Aadi (Karkidaka) July, during Navaratri and in the month of Kaartikai. For the purpose of rites and rituals in the temple of Ambal is imagined as (Sankalpam) as Balambika, the kid goddess. The goddess is considered as Devi Katyayani, one of the Nava Durga here. She is also considered as Bhadrakali by devotees while worshipping her. Devi Kanyakumari is the goddess of virginity and penance. It is a practice that people choose to receive the Diksha of Sanyasa from here in olden times. The rites and rituals of the temple are organized and classified according to Sankaracharya's treatise. 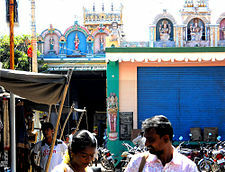 The other attractions inside the temple are the Pathala Ganga Theertham, Kalabhairava Shrine. Kalabhairava is a ferocious form of Lord Shiva who annihilates everything, i.e. Kala or time itself. Each of the 51 Shakti Peetam has a Kalabhairava shrine within the temple meant for the protection of the temple. The name of the Kalabhairava in Kanyakumari temple is 'Nimish' and the Shakti is 'Sarvani' and in the Shakti Peetham of Shuchindram the Kalabhairava is 'Sanhar' and the Shakti is 'Narayani'. These are two Shakti Peetham out of the 51 Shaktipeeth all over South Asia. There are also shrines to Vijayasundari and Balasundari, friends and playmates of the Goddess in her youthful form. Navarathri Mandapam is a hall where devotees can display their artistic ability in music as a dedication to the goddess. Shri pada paara, the rock in the shape of Devi's foot. This is now famous as Vivekananda paara, where Vivekananda got enlightenment to dedicate his life as an active Sanyasi rather than the usual practice of being passive. The Gayatri of Devi Kanyakumari is: "kātyayanāya vidmahe kanyakumāri dhīmahi tanno durgiḥ pracodayāt"
Red Sarees and Ghee wick lamps are offered to the goddess by devotees. Reciting Lalita Sahasranama while approaching and circumambulating the temple is considered auspicious. The location Kanyakumari, i.e. the southern tip of India has been held sacred by Hindus' as it is the confluence of three seas. Offering Pitru Tarpan and bathing in the sea in the Kanyakumari beach is considered holy because it the convergence of many important Theertham. There are a total of 11 theerthams associated with the temple in the ocean surrounding Kanyakumari. Navarathri festival: 9 day festival in (September–October). The music artists get opportunity to offer their artistic skill to the devi by performing in the Navarathri Mandapam. Vaisakha festival: 10-day festival in May–June culminating by a Thoni Ezhunellathu in May–June. During this festival Devi will be taken in procession both in the morning and evening, during Aaraatu the eastern door is opened. On the ninth day, the Thoni Ezhunellathu takes place. Devi will be taken round the water on the western part in a boat. Kalabham festival: The idol is smeared in Sandal paste in the last Friday of the month of Karkidaka or Aadi, in July–August. The temple is opened for darshan from 6.00 a.m. to 11.00 a.m. and 4.00 p.m. to 8.00 p.m.
^ a b c d e "Legends of Kanya Kumari". Amritapuri. 8 February 2000. Retrieved 2013-07-24. ^ a b c d e "Kanya Kumari Temple". Kanyakumari info. 2012. Retrieved 2013-07-24. ^ Manna, Sibendu. Mother Goddess Candi: Its Socio Ritual Impact on the Folk Life. South Asia Books. ISBN 8185094608. ^ a b c d e f g h i "Kanyakumari Temples of Tamilnadu". templenet. 2013. Retrieved 2013-07-25. ^ a b c d "Siri kanyakumari Amman temple". Dinamalar. 2013. Retrieved 2013-07-25. ^ a b c (Translator), Arthur Berriedale Keith (April 29, 2009). The Yajur Veda (Taittiriya Sanhita). BiblioBazaar. ISBN 055913777X. ^ "Dakshinachara". Taantrik.com. 21 April 2013. Retrieved 25 July 2013. ^ a b Harshananda, Swami (2012). Hindu Pilgrim centres (2nd ed.). Bangalore, India: Ramakrishna Math. pp. 63–6. ISBN 81-7907-053-0. (Translator), Ralph T.H. Griffith (June 8, 2006). The Hymns Of The Rigveda V1. Kessinger Publishing, LLC. ISBN 1428630775. (Translator), Ralph T.H. Griffith (January 18, 2008). The Rig Veda: Complete. Forgotten Books. ISBN 1605065803. (Translator), Maurice Bloomfield (September 10, 2010). The Hymns Of The Atharva Veda. Kessinger Publishing, LLC. ISBN 1162667109. (Translator), Arthur Berriedale Keith (April 29, 2009). The Yajur Veda (Taittiriya Sanhita). BiblioBazaar. ISBN 055913777X. Dallapiccola, Anna L (2002). Dictionary of Hindu Lore and Legend. Thames & Hudson. ISBN 0500510881. (Translator), F. Max Muller (June 1, 2004). The Upanishads, Vol I. Kessinger Publishing, LLC. ISBN 1419186418. (Translator), F. Max Muller (July 26, 2004). The Upanishads Part II: The Sacred Books of the East Part Fifteen. Kessinger Publishing, LLC. ISBN 1417930160. (Translator), H.H Wilson (November 4, 2008). The Vishnu Purana - Vol I. Hesperides Press. ISBN 1443722634. (Translator), H.H Wilson (January 31, 2003). Select Works Of Sri Sankaracharya: Sanskrit Text And English Translation. Cosmo Publishing. ISBN 8177557459. Aurobindo, Sri. "The Mother". ISBN 0-941524-79-5. Pattanaik, Devdutt. The Mother Goddess: An Introduction[permanent dead link]. ISBN 81-87111-45-3. Pintchman, Tracy (1994). The Rise of the Goddess in the Hindu Tradition. SUNY Press, New York, USA. ISBN 0-7914-2112-0. Sen, Ramprasad (1720–1781). Grace and Mercy in Her Wild Hair: Selected Poems to the Mother Goddess. ISBN 0-934252-94-7. Wangu, Madhu Bazaz (2003). Images of Indian Goddesses: Myths, Meanings, and Models. Abhinav Publications, New Delhi, India. ISBN 81-7017-416-3.